The NHS puts lots of effort into planning for a major incident - whether it is a terrorist attack, a cyber-attack, an outbreak of infectious disease or simply a major power cut. But what the past few months have shown is that the dedication and goodwill of staff play a vital role. After both the Westminster Bridge and Manchester concert attacks, hospitals ended up turning away doctors, nurses and other staff who were volunteering to come in. The actions of Dr Malik Ramadhan, divisional director of emergency care and trauma at the Royal London Hospital, where 12 of the London Bridge and Borough Market victims were taken, are a perfect illustration of this. 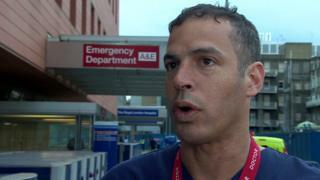 Dr Ramadhan had finished his shift and was cycling home over Tower Bridge at the time of Saturday night's attacks. "I was completely oblivious," he says, "and as I got to the Old Kent Road a large number of police vehicles came whizzing past, more than I've seen before, and I thought that's a bit unusual. "Given what's been happening, I thought I had better go back to work." Dr Ramadhan got back to the hospital and was told it had been put on a major incident alert and to expect multiple casualties. "We don't get told specifics," he says. "We get told something really bad has happened, and we have a plan to prepare for something really bad." The team started clearing beds, contacting on-call staff and messaging colleagues to see who might be able to come in and help. "By the time patients arrived, we had fully staffed resuscitation bays to receive each of the patients," Dr Ramadhan says. "The 12 were all very badly injured. The people who were stabbed had been stabbed with the clear intent to kill." Dr Ramadhan says the injured were badly shocked - startled to the point where they could not speak. But hospital staff were prepared. "People are ready," he says. "The major trauma system in London has been preparing itself for something to happen." Dr Ramadhan says off-duty doctors who might normally go out on a Saturday night have been staying sober in case they are needed. "Doctors like myself who might have been going to Borough after a night in work [are not]," he says. "As Saturday night is testament, we had a lot of people who were completely sober and ready to help the public." NHS England chief executive Simon Stevens says the weekend's attack once again shows the NHS is "ready and able to respond to such attacks thanks to the professionalism and bravery of our staff". One of the first decisions senior managers need to make is just how many staff are needed. An incident on a Saturday night - when staffing is at its lowest - requires many more being brought in than an incident in the middle of the day during the week. For example, at the time of the attack the Royal London Hospital had just one operating theatre open, but that quickly became five. But a single hospital is just one part of the jigsaw when it comes to major incidents. The victims of the London Bridge attack were treated at five hospitals. They came under the control of the Gold Command system, whereby senior officers from the emergency services take strategic control of incidents from a control centre. Each hospital has its own contingency plans in place - in fact they were asked to review these just over a week ago after the Manchester attack. With three terror incidents and a cyber-attack in just three months, the NHS must be primed for any eventuality.